Auchentoshan American Wood is aged only in first-fill ex-Bourbon casks. This non-age statement Whisky is the latest permanent addition to the Auchentoshan range. You'll get lots of vanilla sweetness here, with a smooth liquid owing to the triple distilled process Auchentoshan has put this Whisky through. Definitely a fan favorite and a good aperitif or even if you want to share a casual dram over dinner. 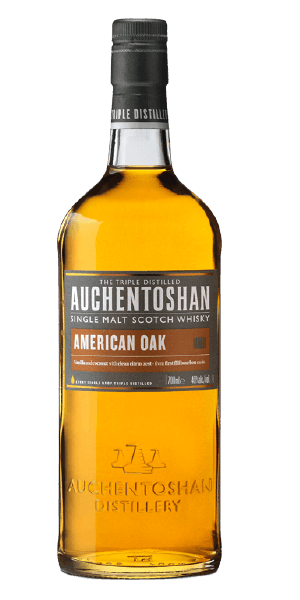 What does Auchentoshan American Oak taste like? The Flavour Spiral™ shows the most common flavours that you'll taste in Auchentoshan American Oak and gives you a chance to have a taste of it before actually tasting it. Vanilla, ripe fruit, citrus zest. Light, slightly sweet, mild spice, pepper, nuts. I love this Scotch! Smooth, full flavored and great for sipping! A nice smooth whiskey that's easy to sip. Has some nice spicy notes as it's finished in American bourbon casks. One of my favourite repeat buys! Really like the smell and the flavor . Can either drink straight or over ice very nice drink for get together. I enjoyed this dram. The zesty nose was pleasant. Nutty and spicy on the palate, with a hint of pepper and vanilla. The finish was was a pleasantly sweet surprise. I wanted to try a quintessential lowlands dram and this did not disappoint. It's a little too light for what I feel like drinking on a normal basis, but it won't go to waste. Nice easy drinking scotch. Not too Smokey, not too harsh. I'm new to scotch and this one may take a few tries for me. Good smokey nose, follows through to the finish. BAM! Now that is a fine whisky!!! A very fine way to relax and enjoy a fairly uniquely diverse wood and very nice but light hint of smoke on the quite lengthy finish. Have a dram and enjoy! You don't ship to Massachusetts I'm at a loss.so I can't join. Long lasting flavor with medium warm finish. Smokey, old wood nose. Water adds malty nose and creamy, soft taste. A pleasant vanilla scent with a smokey bite to the finish. This tasty Lowland scotch is a lighter style with lots of bourbon oak vanilla and spice...A very nice after dinner dram! First taste is a bit weak. Aftertaste is very outspoken. A delightful lowland whisky. It was a great dram after a long trip accross country. Not tremendously peaty, but floral, and had hints of coconut and flowers. This is my go to whiskey if I am needed a drink while I watch a movie or if I'm sitting on the back porch watch my kids play in the summer. It is very sooth and easy to drink. It is also the whiskey that I use for mixing drinks. That being said it has no real deep characteristics that make it worth sitting down and really enjoying the it for what it is. It lacks complexity. Overall not a bad scotch just not a great one either. If I could give it 6.5 I would. Auchentoshan, though somewhat satisfying for a single malt, lacks the subtle nuances and layering of flavor profiles in nose, palette, and finish that I yearn for in my single malts. The spice, burn, and finish are barely detectable. I imagine it to be a great "starter scotch" for those new to scotch in general due to its exceptionally mild honey-like sweetness. My personal preference is for anything with an intriguing complexity of character that cleverly reveals a complex flavor spiral from nose to finish (MacAllan, for example, exemplifies this for me). Overall, I found Auchentoshan soft, bland, and a smudge too oily. Sweet but not so much that it's doesn't warm your pallet. I found myself coming back to this as it is a smooth and easy friend to sit with after a long day. I liked this but not as much as some others. Plus i can buy this a little cheaper from my local store for less than what it sells here. Not bad, but not great, some what smooth but nothing about the flavor stood out to me.